Mike Colter is an American actor. Colter was born in Columbia, South Carolina, and grew up in St. Matthews, South Carolina. He is a graduate of Calhoun County High School. His senior year, his senior superlative as voted by the class was “most ambitious.” Colter spent a year at Benedict College, before transferring to the University of South Carolina, from where he received a bachelor’s degree in theater in 1999. He obtained an MFA degree in acting from the Rutgers University Mason Gross School of the Arts. Colter’s highest profile role was in the film Million Dollar Baby, in which he portrayed boxer Big Willie Little. He has also guest starred on Law & Order: Trial By Jury, The Good Wife, ER, and The Parkers, as well as several TV movies. He also starred in the series Ringer. In 2014, Colter began portraying the role of Agent Jameson Locke in the Halo franchise. Colter starred in the series Halo: Nightfall and provided the motion capture for Agent Locke in Halo 5: Guardians. 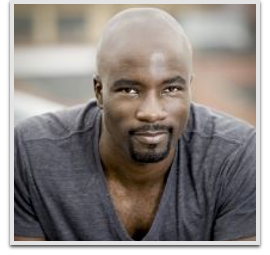 He will also be playing Luke Cage in Marvel’s Jessica Jones, followed by the character’s individual series, Marvel’s Luke Cage.